For much of the last decade Entergy Nuclear, the owners of the twin Indian Point reactors in New York, have battled environmental regulators from the state and federal government over the continued use of enormous volumes of Hudson River water to quench its power systems. Their federal court suit, joined by a coalition of environmental organizations and New Jersey, New York, and four other states, culminated in a 2009 decision by the U.S. Supreme Court upholding their contention that wedge wire systems were not designed for nuclear power plants and could not meet the requirements of the Clean Water Act. ( http://www.rogerwitherspoon.com/docs/entergybriefentergyvepa1-07.pdf ). The High Court also agreed with Entergy’s position that federal regulators could use cost benefit analysis to determine the most effective and reasonable means of ordering compliance with environmental laws, even though that sort of calculus could short change non-commercial aquatic life. Now it’s time for a full reversal. On Monday, Entergy began four months of hearings before New York State Administrative Law Judges in an effort to prove that wedge wire systems installed in front of its nuclear plans would nearly eliminate the annual destruction of some two million juvenile and adult fish and some 300 billion hatchlings and baby fish. If the judges agree, Entergy could avoid having to retrofit the plants with an expensive closed cycle cooling system, which functions like the recirculating radiator on an automobile, but on a massive industrial scale. Such systems range in cost from about $400 million for a mechanical draft which resembles a four story warehouse, to a massive, 150-foot-tall cooling tower costing a projected $1.5 billion. At stake is the continued operation of the power plants which provide about 5% of the electricity used daily in New York City and adjacent Westchester County. For without the permit from the state Department of Environmental Conservation to take water from and discharge it back into the Hudson River, the plants cannot operate regardless of whether their contested licenses are renewed by the federal Nuclear Regulatory Commission. Phillip Musegaas, program director for the environmental group Riverkeeper – which was also involved in the 2005 suit against the EPA – said “we do not believe wedge wire is a viable solution. It’s a fact that wedge wire screens have never been used at a nuclear power plant of this size, and we do not believe Entergy has made its case that wedge wire will work at Indian Point. The thermal pollution from heat dumped into the waterways by power plants using once through cooling is tremendous, particularly at nuclear sites. The thermal discharge at PSEG’s, coal powered, Mercer Generating Station in Hamilton, NJ, for example, dumps about 1.5 billion BTUs of heat into the waterway, according to company records. The nuclear power plants at Indian Point and Salem however, dump about 30 billion BTUS of heat hourly into their local waterways. That is the equivalent of the heat which would be generated by exploding a nuclear bomb, the size of the bomb which destroyed Hiroshima, in the waters of the Hudson River and Barnegat Bay every two hours, all day, every day. It is one reason by the environmental regulators in both states are pushing for closed cycle cooling systems. 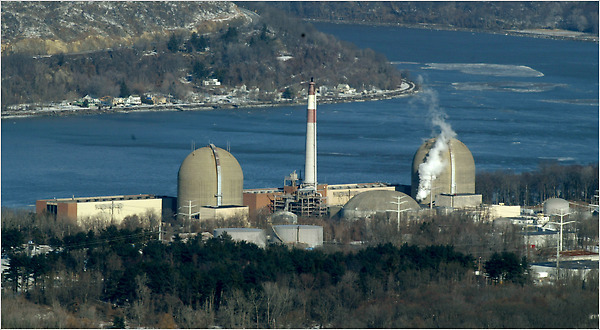 Indian Point is confronting the same issue which resulted in the agreement between the New Jersey Department of Environmental Protection and Exelon Corp., owners of the Oyster Creek Nuclear Generating Station, to shut down the facility on Dec. 31, 2019. The agreement, worked out by Gov. Chris Christie, was formally ratified by the NRC last week. Edward Miller, project manager in the NRC’s plant licensing branch, stated in a letter to Exelon President Michael Pacillio that “we will continue to verify the safe operation of the plant via the planned oversight” and factor into the review programs to end the operations. Oyster Creek is the first of nine power plants in New Jersey which are being targeted by state environmental regulators which kill an estimated nine million fish in their cooling systems. 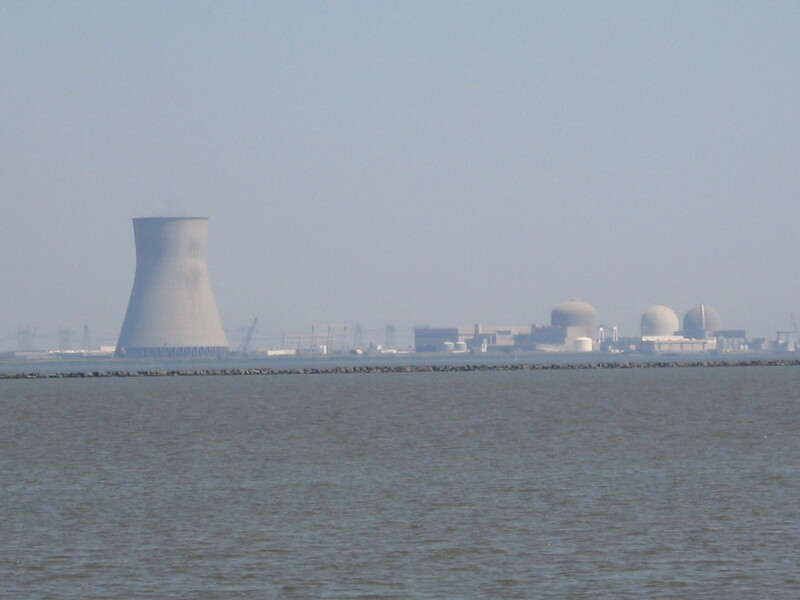 New Jersey’s efforts to force compliance involve four plant sites operated by PSEG – ranging from the twin reactors at the Salem Nuclear Generating Station, which use 3 billion gallons of water daily, to the Sewaren natural gas plant using 540 million gallons daily; as well as plants operated by Exelon, RC Cape May Holdings, and Calpine. In New York, environmental regulators are going after 40 power plants, ( http://www.rogerwitherspoon.com/viewer/vwnukegrphc14.html ) including Indian Point, which kill some $20 billion juvenile and mature fish annually in waterways around the state ( http://www.rogerwitherspoon.com/viewer/vwnukegrphc15.html ). But the biggest impacts are created by the gauntlet of power plants along the Long Island Sound and the lower Hudson River which kill fish by the billions as they migrate up to 200 miles from the Atlantic Ocean to spawning sites along the Hudson River. The scale of the destruction can be seen in the NRC’s environmental assessment of the twin Indian Point nuclear plants in Buchanan, 30 miles north of Manhattanin the heart of the Hudson Rivertidal estuary. In determining that the overall impact on essential fish habitat is “small to moderate” the agency noted approvingly that new screens installed in front of the 40-foot-wide intake pipes in 1984 had reduced the destruction of baby fish between 1984 and 1991 by 187 Billion per year to its present rate of just 300 Billion newly hatched fish ( http://www.rogerwitherspoon.com/docs/nrc-finalipieis-part2-12-10.pdf ). 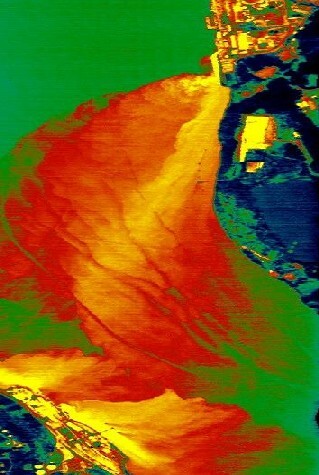 The National Marine Fisheries Service, responding to the NRC’s environmental analysis of Indian Point, ( http://www.rogerwitherspoon.com/docs/nmfs-eisfor1p23-10-10.pdf ) found that the “once through cooling systems” are vacuuming up trillions of newly hatched fish – those under a half inches in length – and destroying them in their heat exchangers. The NMFS directly challenged the finding by the NRC that the damage to the aquatic environment is “moderate”, and asserted there is “strong evidence” that the decline in fish stocks along the entire northeast Atlantic seaboard is due more to the destruction of baby fish than to over fishing of adults. “The NMFS does not reach all of the same conclusions as the NRC with respect to adverse effects that relicensing IP2 and IP3 would have on the fishery resources and their habitats,” Peter Colosi, the agency’s assistant northeast regional administrator, wrote in an acerbic analysis of the impacts of theHudson Rivernuclear plants. The hearings challenging New York’s attempt to force Entergy to build a closed cycle cooling system as a prerequisite to getting a discharge permit are scheduled to run through February in the agency’s Albany offices. The daily hearings will cover several controversial subject areas, including the wedge wire from Monday through Nov. 8; radioactive materials in the environment from November 14 through December 9; and, and protection of endangered species from December 12 through December 16. Hearings are tentatively scheduled to run through Feb. 24, covering these and other items as needed.